What I found interesting about the young Ruth here, is that so much is still relevant to the older version. 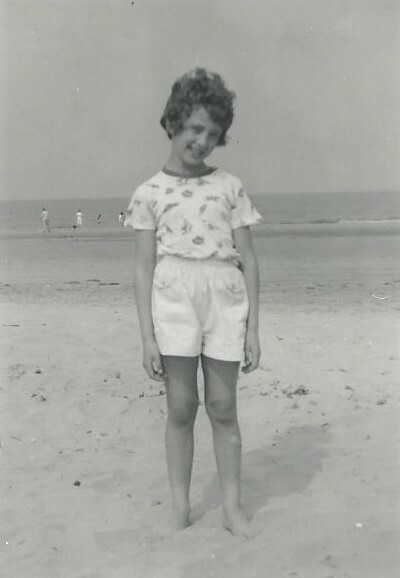 I am never happier than by the sea, still have the unruly curls and am not adverse to a little posing. Born and raised in Doncaster, South Yorkshire, in the year Harold Macmillan said ‘we never had it so good,’ that was certainly my take on things as a kid growing up in the 60s. Always a coal fire ablaze in the hearth, smoking chimneys, great home cooking and nothing more to worry about than itchy balaclavas and Tuf shoes that were impossible to wear out. And joy of joys, stories everywhere: in the books borrowed from the local library, old action movies on the rented TV and the occasional treasured visit to the cinema. On my first holiday ‘abroad,’ beyond the boundaries of Yorkshire, I found myself at the age of ten on a school trip to the Lake District. Remembering still, how this landscape, green, wet and mesmerizingly beautiful, had a profound effect upon me, it is perhaps no surprise that I have now spent half my life living and working in Scotland. On moving from the West Coast to Perthshire, I initially worked as a Regulation Analyst in the energy sector, but when the opportunity presented itself, I headed off to study English and History at the University of Dundee. Fast forward another decade or so, and I find myself in the enviable position of being a writer. However, this is not, I now realise, the easiest profession in the world!